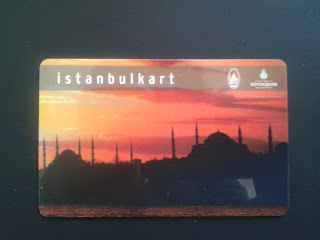 Unlike Peter and me, our son Jon has never been to Istanbul before this trip, yet it is he who introduces us to one of the latest phenomena in modern technology - the Istanbul card. For about $3, or €2.50 you can buy this card and then fill it up, like the tank in your car. If it approaches "empty", you can simply top it up with more money on your card. With this ticket, you can ride anywhere in metropolitan Istanbul, which can be more than 30 kilometers from where you are, for about $.90, or €.75. Until the day he announced he needed to buy this card at a kiosk, he had been watching his parents struggle with buying 3 lira tokens in machines, scrambling to get enough change to put into the slot. A 3 lira token is worth about $1.50, or €1.20, costing almost twice the cost of a ride on the Istanbul card. Germany continues to be behind the times when it comes to savvy technological innovation. We only have a plastic card you can buy on a subscription basis after mailing in an application, or a cardboard ticket you can buy in a vending machine. The vending machine has complicated instructions, and this cardboard ticket only lets you ride for one day, in a group, or for four rides, at astronomically high prices. Not being on the lookout for such things, we don't notice this fabulous opportunity to get around much more cheaply and conveniently. But Jon, who has traveled even more widely than we have, has used such cards in places like Hong Kong, Seoul, Beijing, and Singapore. He reads about the card on one of the vending machines at a tram stop, while his parents struggle to buy tokens. He intuits the advantages of the "Instanbulkart" and even knows that he can purchase this card at a newspaper kiosk. He asks us to accompany him to a kiosk. He obvioulsy has plans to use this card with his girlfriend Dayeong, who will be arriving soon from Seoul. We head to the nearest kiosk and buy him a card, still not recognizing the advantages possessing this card will bring us. But I have plans for the day that will involve the use of Jon's card, which we can also ride on. There is unlimited use for as many people and as long as the card is loaded for. You can use the card for the tram, metro, and even ferries across the Bosphorus! What I want to do is use the metro to travel to an Istanbul shopping mall. 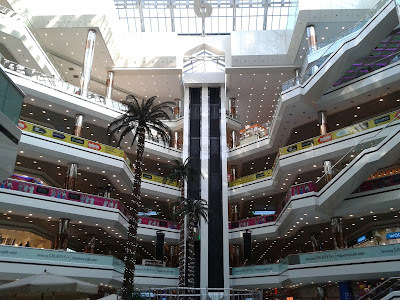 I have heard that Istanbul has fabulous shopping malls, and I want to see for myself. Everyone thinks this is a good idea, so we head for the metro station, just outside our posh hotel. I am amazed. We descend from escalator to escalator into the depths of the earth, even deeper than in London's tube. The walls and floors are lined with gleaming mosaics, and there is not even a scribble of graffiti anywhere. Why can't Germany do anything about kids scribbling everywhere on walls? Where I live, they recently built a new bridge over the freeway, and within days, it was covered with graffiti. 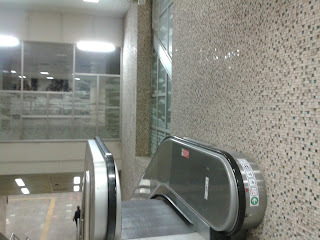 Not only is there no graffiti in the metro station - everything sparkles with cleanliness. There are no mud spots on the floor, there is no film of sand, no grime on the walls. The trains are similar - new, shiny, clean - and fast. The only trouble is, it seems we have to take one line only one stop - to Taksim Square, and change there to get a metro to the stop we want for the Cevahir shopping mall. A nice young man helps us to read and understand the metro map, explaining that he will be getting off at the same stop, so he will accompany us the whole way. "We are so grateful for this metro," he says. "We can travel so much more easily now. Imagine - for only three lira, you can travel way across Istanbul to the other side - you can ride for more than thirty kilometers!" Soon the two sides of Istanbul, European and Asian, will be connected by metro. At present they are separated by the Bosphorus. (By the way, these words in different colors are links - if you click on the words, you can read something about what the link refers to - in this case, an article about the new metro tunnel.) When the two sides of Istanbul are connected, you will be able to travel more than seventy kilometers by metro! We ride for about five kilometers, getting off at the second stop after boarding the train at Taksim. The shopping mall runs right into the metro station, so there is no getting lost. Like the metro station, the Cevahir mall is also gleaming and ultra-modern. This is considered an ordinary Istanbul shopping mall. Apparently, if you want to see real luxury, you need to go to Istinye Park or Kanyon mall. What is this place Turkey all about, anyway? Is this an El Dorado? Istanbul is not only modern, it is ultra-modern! How modern, or how primitive, is the rest of Turkey? Istanbul is very different from the view of Turkey I have when walking down Keupstrasse, the main thoroughfare in one of the Turkish neighborhoods of Cologne. But what I read about in the women's gift shop indicates that conditions are difficult in rural Turkey. This disparity must explain why so many people pour in each day from rural areas to Istanbul, and farther on to Germany. We buy a beautiful wooden salad bowl in an attractive kitchen shop. Outside the shop, we explore more of the mall. The ground floor is full of kitchen, furniture stores and all sorts of shops related to home, including a big supermarket. It seems the Turks love English home decor - we find several shops with English prints on towels, quilts, sheets and kitchenware. There are several levels with department stores, including the German chain C&A and British Marks and Spencer. The top two levels are both food courts and restaurants. The people shopping in the mall look as ordinary as those in Germany or the US. I read that the Turkish economy was growning at about an amazing 8% annually, until 2012. Now it has slowed down to about 2%. Greece's youth unemployment rate (for the -24 age bracket) is a whopping 60%. Still, the level of Turkish youth unemployment is also unsettling - nearly 17%. I hear many Germans are choosing to retire in Turkey, either in Istanbul or on the coast. I'm not surprised. But I'm reading that Turkey is also living in a bubble. Will this bubble burst? There are no signs of it at the shopping mall.